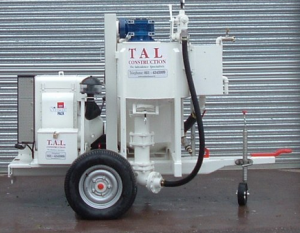 TAL Construction can offer a grouting and grout mixing service with our expert-level Collodial Mixer and Paddle Mixer. This saves valuable time on projects that require grout. T A L Construction boasts high speed, high shear, colloidal grout mixers which provide an extremely efficient means of producing various types of grout. The high speed shearing action of the colloidal mixer achieves a greater hydration of the cement by wetting each individual particle. A high rotor tip speed (2100rpm) provides a high rate of shear in a mix that is fluid and stable enough to be pumped over considerable distances, and it will permeate uniformly in to voids. The mixing time is reduced due to the effect of the vortex created by rapid tangential recirculation of the grout. The unit is fitted with an outlet pipe connected to a hand operated valve, which enables the mix to be discharged or re-circulated. The mixing drum is made from heavy-duty, rolled steel, reinforced at the top and fitted with a flange at the base to allow easy removal from the pump assembly. 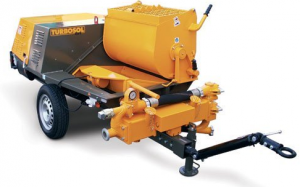 The Turbosol Paddle Mixer is a device used to efficiently produce a high quality mixture of neat cement and water. Its design operates on a horizontal “U” shaped trough that is fitted with dual shafts and paddles extending the full length of the trough. The action of the pitched paddles moves the mixture from the bottom of the trough up each side and forces it back down between the shafts. This repetitive motion results in a comprehensive mixture of materials. If you are considering working with us in relation to grouting & grout mixing, or any of our ancillary services, contact us in our Dublin office on 01 6310300 or in our Cork office on 021 4345999.